Used RadioShack Remote Control A-B Switch Cat. No. 15-1968. A-B Switch and AC Adapter included. Remote control not included. 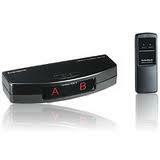 This remote A/B switch allows you to switch between two sources, such as your VCR and a video game.